It is no secret that Fort Worth summers are sweltering. In fact, the average summer temperature can quickly reach over 100°. In order to still have a garden that is full of beautiful blooming flowers, you need to know which ones will be able to withstand high temperatures during the extreme Texas summer. 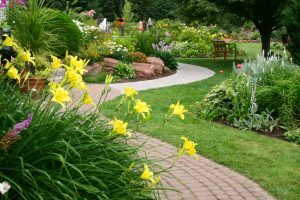 Blooms Landcare is your Fort Worth landscape design company that fully understands how the Fort Worth climate can impact your garden. Here are a few seasonal flowers that will thrive during the summer months. New Gold Lantana, unlike its name implies, actually comes in many different colors. As a native plant of the Dallas-Fort Worth area, these flowers will be able to live from spring all the way through fall. They are a great addition to any Texas garden. If you are interested in planting New Gold Lantana, talk to our landscape designers. Blackfoot daisies are a test native plant with small white flowers and bright yellow centers. These flowers do not grow more than a foot tall, and it is a perfect flowerbed plant that can add some color and variety to your garden. They are also relatively inexpensive and easy to find in the Fort Worth area. If you would like to add some flowers, or need help in designing your garden, call Blooms Landcare. Dial (817) 688-5352 to schedule your appointment with our landscaping experts. Next Next post: Does Your Pool Need a Pool Deck?